after years of people asking us to make the wow and flutter in eurorack format, we are happy to say that the wow and flutter module is finished, and not only does it live up to the original, it has a bunch of new features. and since this is for your modular synthesizer, the headroom has increased to 10 volts peak to peak. 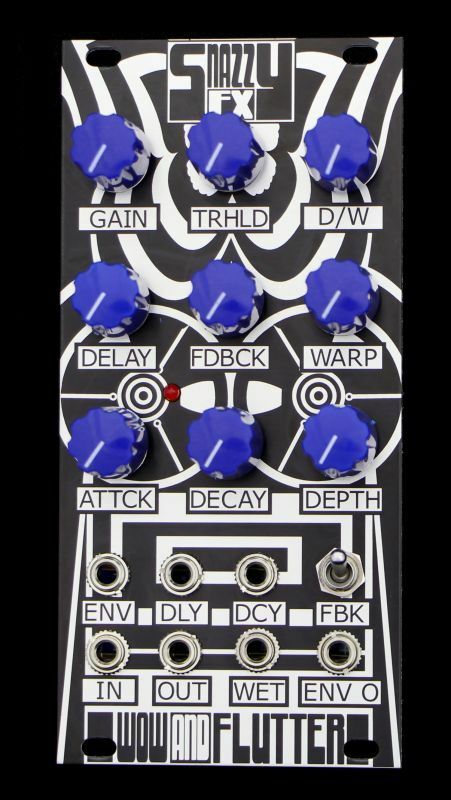 effects possible with this module range from subtle tape warble to full-on pitch weirdness, snapback delay, rubbery sounds, dark echo, delayed swells, and self-oscillating feedback madness. using it as a regular delay with the warp knob turned down, the color is dark and soft. turn up the warp halfway and you begin to get pitched delays and warbly goo. turn warp all the way up and it has a unique sound all its own. for those of you who have never tried a wow and flutter, it is so much more than a delay. in fact the original intent of the box wasn't delay at all, it was the sound of the tape machine eating your tape. but it can do delay. and it can also do spiky sounds. and boing sounds. you just have to play with it. and using it on drums and synths allows a whole new basket of sounds to crash through your speaker. we have added cv control of delay time (attenuated by the depth knob) as well as an external envelope input and cv control of decay time. so you have external control of 3 parameters. we have also added two feedback modes. with the toggle switch in the top position the feedback is very calm and resembles the original stompbox. with the toggle flipped down, watch out! at max feedback it only takes a second or two to go into self-oscillating distortion. but turn it down just a touch, and you can get quite a bit of control over your dubbed out explorations. the attack and decay controls are exactly as they were on the original but we have added a jumper on the back of the module for those who wish to take their warbles into extreme regions. simply move the jumper into fast mode. we have also future-proofed this module by adding an expander port in the back. coming sometime in late 2013 you can expect an expander which will add even more modulation weirdness and control to your new favorite delay module! and that's not all. there are two extra jacks which were not found on the original. wet out and env out. wet out is fully wet. use this in combination with the envelope input for unique sounds, or just use it to add to your mix. the env out allows you to take the wow's envelope follower control output and patch it into your filter cv or vco cv..create interesting feedback loops where the wow is responding to the very amplitude and pitch that it is effecting! there is also a new env led, so now when you dial in the threshold control, you can see exactly when and how intensely the warp function is going to garble your sound. so in closing, the new wow and flutter module has a bunch of new features, keeps all the old ones, and in the process ends up as a very powerful modulation tool. we have put up some videos to let you hear the wow processing drums and synths. with just a few knob turns you can really change the entire character of your input. the depth of the module is around .8"---which means it will fit happily in your skiff. current draw is about +/- 45 ma.